Poppysuna tries to comfort a worried Nico in the waiting room. Over at GENM, Papa Dan interrupts Hiiro’s alone time, expressing his disappointment at his failure earlier. 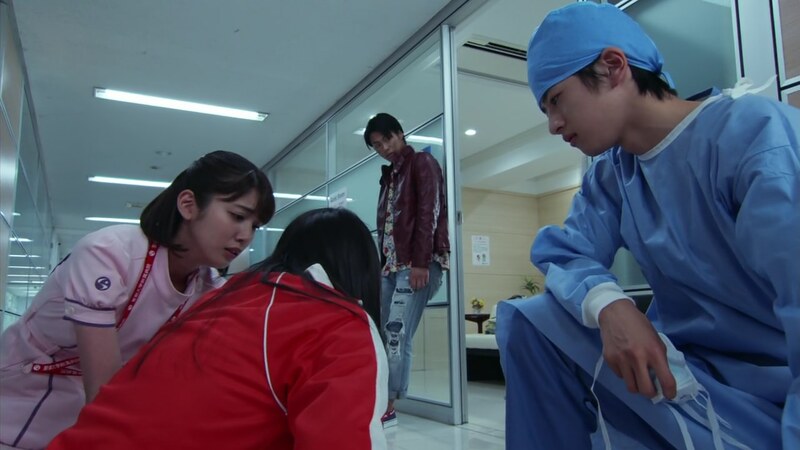 But Director Kagami calls his son, telling him to return to the hospital and perform the surgery Taiga needs. Before Hiiro can answer, Papa Dan grabs the phone and hangs up. Taiga’s condition is worsening. They’re running out of time. Director Kagami goes to the waiting room to tell Nico and Poppysuna about needing Hiiro to perform the surgery. He tells them about unsuccessfully trying to contact Hiiro, but just then, Hiiro comes walking down the hall. Nico begs him to save Taiga, He heads straight in. Across town, Graphite is happy Taiga has been dealt with and tells Parado they should focus on Hiiro next. Parado agrees. But Papa Dan, already henshined, arrives to finish them off. Graphite and Parado henshin. Kagami-sensei enters the operating room ready to go. Emu thanks Hiiro for being here. It’s almost 9pm when the surgery begins. 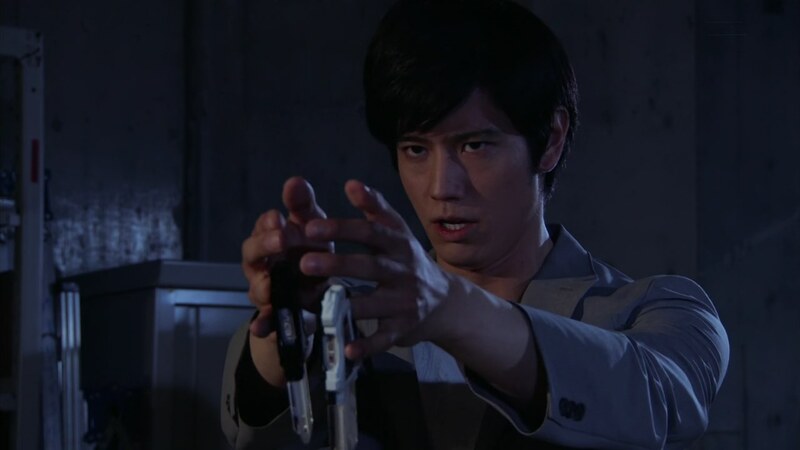 Over at the CR, Kuroto and Kiriya talk about how Parado dying would be bad for Emu’s ability to henshin, thus losing their only chance against Chronus. They both data themselves off to where Parado, Graphite and Papa Dan are battling. Graphite infects Papa Dan’s Driver with the Gamedeus virus, disabling the Pause feature. But Papa Dan pulls out his power up tokens which he can control and use at will. Papa Dan uses Muscle Up and Steel tokens to give him the power up he needs to force Parado and Graphite to dehenshin. Before Papa Dan can finish them off, Kuroto and Kiriya arrive, already henshined. That allows Graphite and Parado to escape. 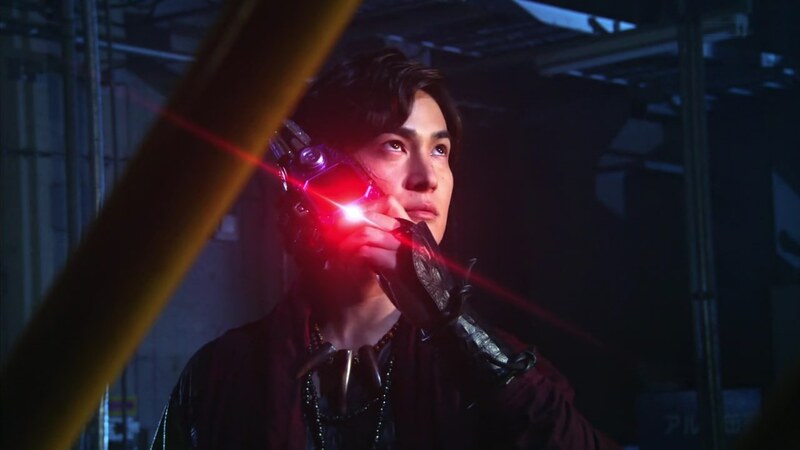 Papa Dan takes on both Kuroto and Kiriya, no problem. Kuroto says he will use as many lives as he needs to defeat Papa. But Papa Dan reveals that he gave Hiiro a choice. 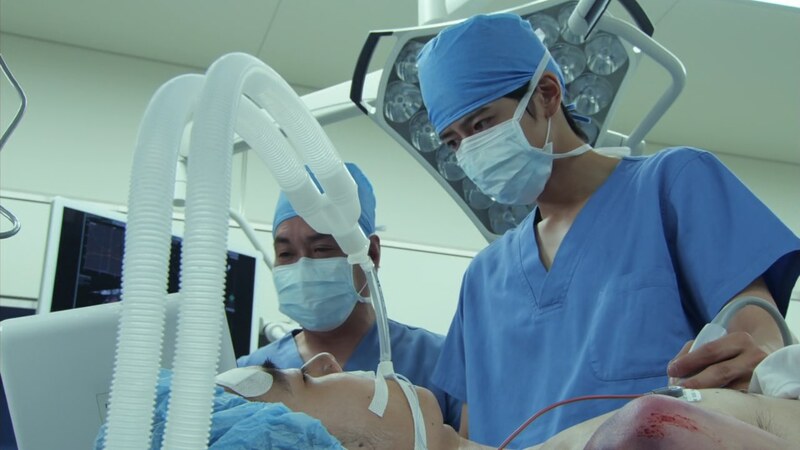 He told Hiiro to go perform the surgery, but to make a mistake that results in Taiga’s death. Otherwise, Papa Dan will delete Saki’s data for good. Kuroto henshins again and Kiriya leaves to warn the others about the plan. Director Kagami doesn’t think Hiiro would ever do such a thing as to murder a patient. But Nico runs out and screams to stop the operation. The doctors hear the commotion and Emu says he will go out to take a look. Nico screams that Hiiro intends to botch the surgery on purpose. 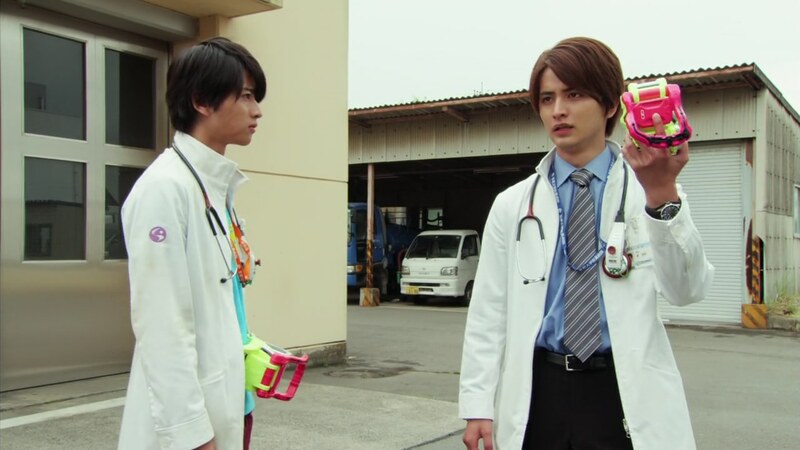 The other doctors are shocked, but Hiiro orders Emu to get Nico to shut up. He continues the surgery. Emu goes over to Nico and tries to calm her down. He tells Nico to believe in Hiiro. Poppysuna and Director Kagami believe Hiiro would never let a patient die. Poppysuna takes Nico back into the waiting room. Emu asks Director Kagami to take care of things here before he runs off. Hiiro thinks about his various encounters with Taiga, including him saying Hiiro should move forward thinking about a future with Saki. Kuroto now only has 70 lives left and is weak from dying over and over. But Papa Dan dehenshins just as Emu arrives. Kuroto leaves. Emu asks Papa Dan to hand over Saki’s data. Papa Dan says if Emu henshins, he’ll delete Saki immediately. And Hiiro would hate him forever. Papa Dan slaps Emu. It’s just about 1am and Taiga’s vitals are erratic. 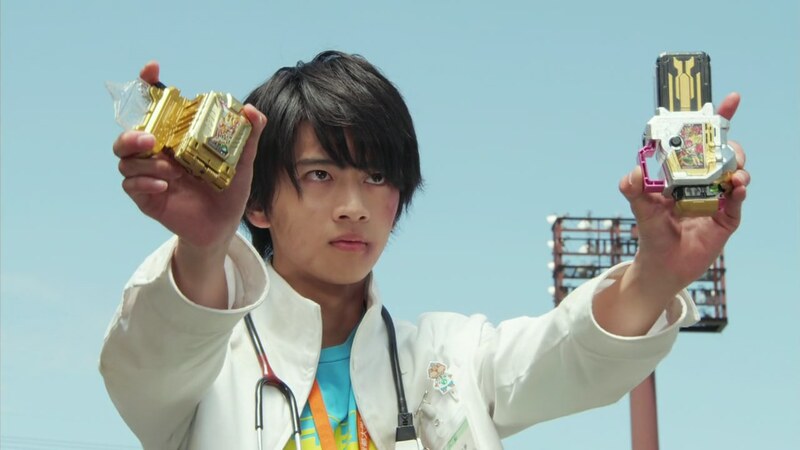 Hiiro assures the other doctors that it will all be over soon. Papa Dan proceeds to beat Emu down physically and emotionally, laughing that Hiiro will kill Taiga for good on the operating table. It’s just past 3am when Hiiro comes walking out of the operating room. He doesn’t say a word to the waiting loved ones as he leaves the hospital. Papa Dan has been beating Emu up for a few hours. It’s just before sunrise. Papa Dan is ready to finish off Emu for good. But suddenly, Hiiro comes walking toward them. What’s the result of the surgery? Emu asks. Hiiro does not answer. Papa Dan is satisfied. The sun begins to rise over Tokyo. 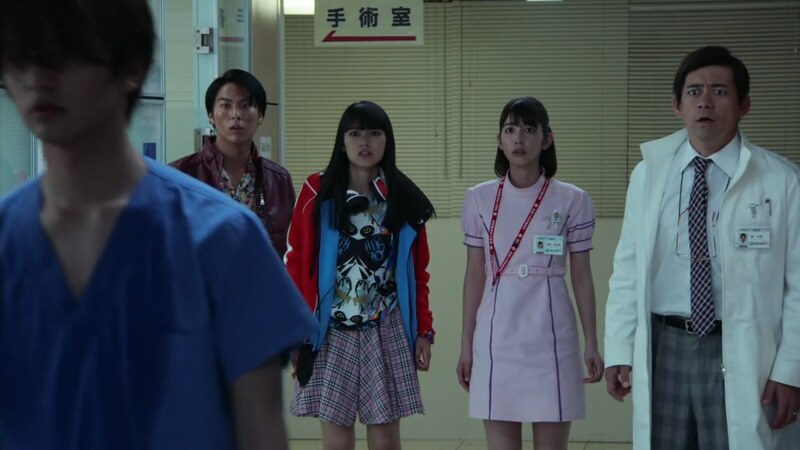 Nico, Poppysuna and Kiriya are in Taiga’s hospital room. He is stable. Emu is relieved. 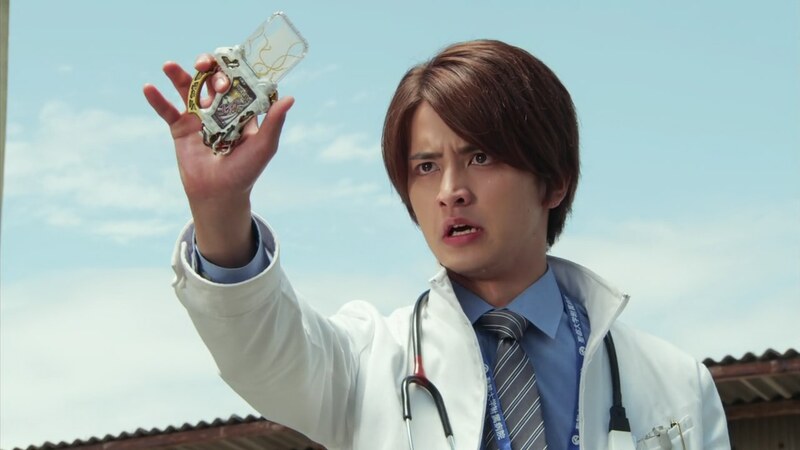 “I’m the world’s best doctor,” Hiiro says. He would never be able to forsake a life right in front of him. Papa Dan is very disappointed. He takes his Driver and prepares to delete Saki for good. Emu yells for Papa Dan to stop, but Hiiro tells Emu to step back. Tears fall down Hiiro’s face and onto the ground. Rainbows! Emu walks over, his answer to Hiiro’s remorse. Papa Dan deletes Saki’s data before henshining. Emu and Hiiro both henshin to their max levels. And that appears to be too much for Papa Dan. With a Hyper Critical Sparking and Taddle Critical Strike, Emu and Hiiro are able to force Papa Dan to dehenshin. But Papa Dan blows smoke and poofs away. Emu dehenshins and approaches Hiiro, but Hiiro asks to be alone first. Emu says he’ll see Hiiro in the CR and hurries back to the hospital. Hiiro dehenshins and collapses to the ground as the rain starts to fall. His tears begin to fall again as well. Later, Taiga wakes up. Emu says he is doing well so far and there’s nothing to worry about. Poppysuna says it’s all thanks to Hiiro performing the surgery. 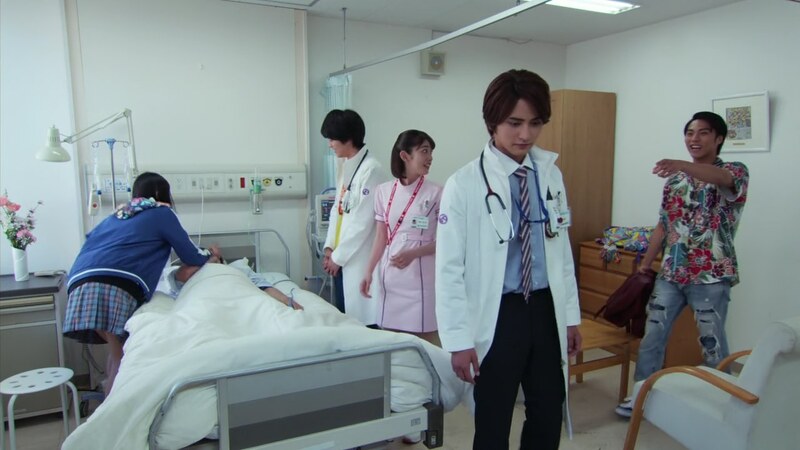 Kiriya pushes Hiiro toward Taiga’s bedside. Hiiro confirms he is returning to the CR. But he also wants to apologize to Hanaya-sensei for all the disrespect he’s shown towards him. Hiiro bows, but Taiga says he should be the one apologizing since Hiiro saved his life. This episode though definitely succeeded in being very dramatic. The result was predictable, but the substance of the episode was pretty good. On the other hand, it was a good way to give a little depth to Hiiro’s character. I think the seeds were planted early on in a way that allowed Hiiro to either become simply emotionally unstable or a full-on traitor or just simply a Kumon Kaito-type guy. 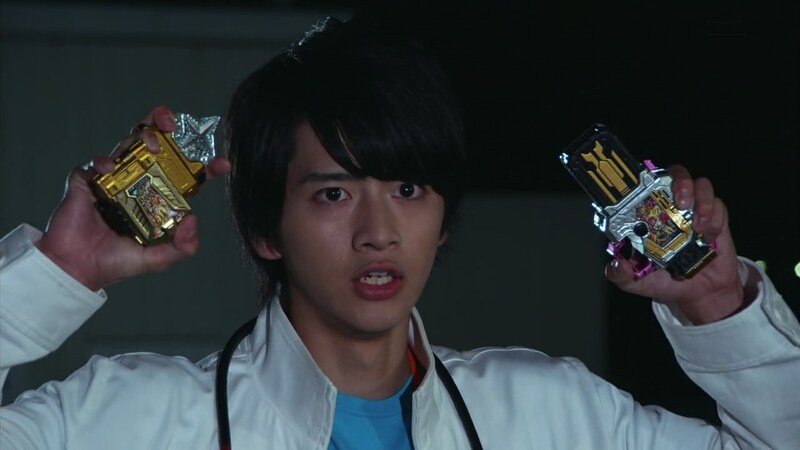 I remember noticing after several episodes how Hiiro seemed to be kind of erratic in characterization. Or even lacking in characterization. (Or just simply, kind of a jerk.) But after this little arc, I can accept him having inner struggles which then made him more willing and susceptible to Papa Dan’s control and enticing with undeadSaki. So the drama this episode of him struggling between being a doctor and saving his dead girlfriend was believable. I’m certainly with Nico. I wouldn’t trust Hiiro so easily either. lol They don’t know what Papa Dan’s been brainwashing him with. But in a way, I feel like Hiiro making this decision supports the idea that in the end, they’ll find out that no, you can’t bring dead people back to life using a video game. That’s in addition to both Kuroto and Kiriya seemingly not like their pre-death selves. Who knows, the character inconsistency with them two might just be bad writing. But I’m still betting on the theory that they’re avatars who aren’t completely human or whole. Taiga though, I’m not so sure about. 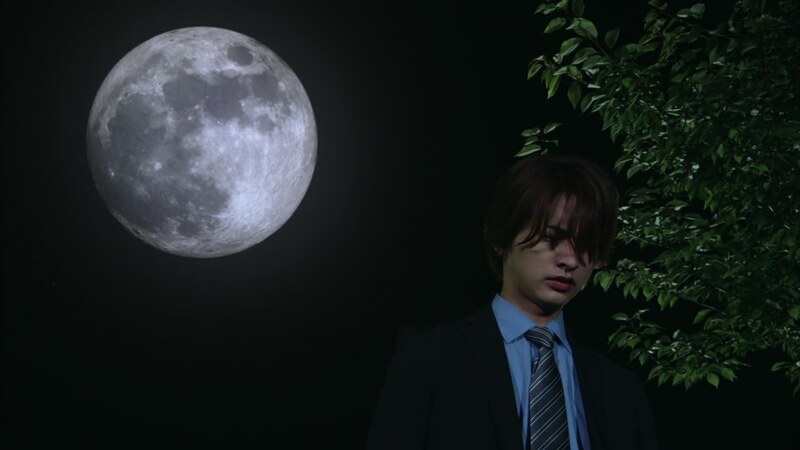 He felt guilty about his part in Saki’s death. But now that reminds me how he wanted to get rid of all the Bugsters himself, all rogue-like. I feel like that’s been dropped. The Graphite connection wasn’t really fleshed out well. And his relationship with Nico, whatever you label it, has been played more for laughs than anything else. Though of course, that relationship came in very handy this episode as Nico played the grieving not-widow. So now that the Saki plotline seems to have wrapped up, it’ll be interesting to see what they do with him (and Nico I guess) in the final episodes. I won’t speculate on what next episode is about. But Parado and Graphite have really been irrelevant since Papa Dan took over. I do think Parado and maybe even Graphite play a bigger role in the endgame than Papa Dan will. But they’ve really felt like just extra characters lately. Hopefully that changes and it was only to make way for this Hiiro arc. Anyway, I enjoyed this episode. It worked for me. 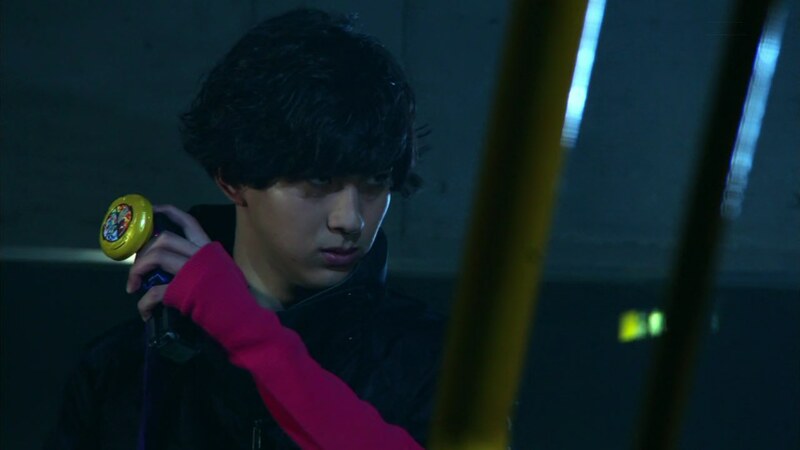 At this point, Hiiro feels more like Mitsuzane Lite than Kumon Kaito. The one issue is that they tried to do what took Gaim several arcs to build up for Micchy in just 1-2 arcs. Although, yeah, that was somehow mitigated by the fact that they established early on how significant Saki is going to play into Hiiro’s narrative. That’s in addition to both Kuroto and Kiriya seemingly not like their pre-death selves. Who knows, the character inconsistency with them two might just be bad writing. But I’m still betting on the theory that they’re avatars who aren’t completely human or whole. I have an interesting theory here. Considering the fact that Saki was only “revived” as a looping recording of her last words, it’s likely that there was no way for to revive a vanished one’s whole personality all along. And that both Shin Kuroto and “Kiriya” are just AI’s that only have parts of the personalities of the originals and not the whole. Papa Dan likely knew it right from the start and just played with. Hiiro’s own insecurities. Yeah, if they had gone the Kaito route with Hiiro, I think it would’ve been reasonable. But I can definitely see the Micchy comparison too. And that theory definitely plays into the whole “gamemaster” idea with Papa Dan pulling the strings any way he wants. Basically what Kuroto wanted to do.